My family love pancakes. When pancakes are for breakfast my kids are very happy kids. These pancakes are so delicate, they taste of fluffy lemony perfection. I love lemon flavoured desserts, and these pancakes are so good the lemon shines through, but doesn't overpower. Another thing I love is buttermilk. It is one of those ingredients that makes everything taste better. Any cake or dessert that I have tried that has buttermilk in it, I have loved. I don't why, I assume as it adds a little tartness, it counters the sweetness, and as I don't like really sweet things, it makes desserts the perfect sweetness for me. A little more effort is needed for these pancakes than other pancakes, by extra effort I mean, you need to whisk some egg whites. So what I am really saying is these are easy to make. I like to make them smaller, in between pikelet and pancake, makes for easier flipping. But you make them, how you like them. If you strawberries are small, just halve them. If you like honey, you can macerate the strawberries in honey instead of sugar and lemon juice. I just don't like the particular taste of raw honey. To fry, you can use butter, but I like cooking spray, as it doesn't burn quickly. If you love lemon and you love pancakes, try these, so easy, so perfect. 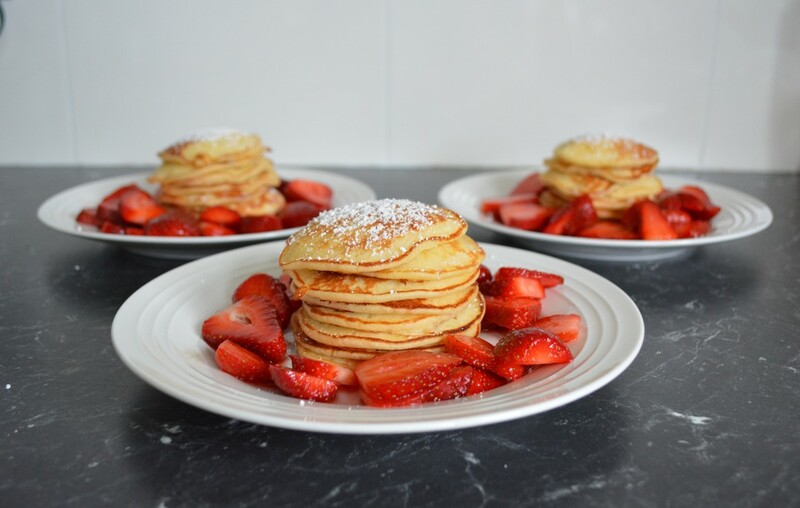 In a bowl, place the strawberries, caster sugar and lemon juice, give it a stir and leave to macerate while you make the pancakes. Place buttermilk, egg yolks, lemon juice and zest, and vanilla extract in a bowl and whisk until combined. Add the melted butter and mix well. Sift flour, baking powder, caster sugar and salt into a large bowl. Make a well in the centre and gradually stir in the buttermilk mixture until the dry ingredients are just moistened, be careful not to overmix. Place the egg whites in a dry, clean bowl and beat with electric mixer until soft peaks form. Gently fold the egg whites into the batter, using a large metal spoon. Lightly spray a non stick frying pan over medium heat with cooking spray. Drop 2 tablespoons of batter per pancake into the pan. Cook the pancake until golden brown on the underside, it has bubbles on top and it is looking dry at the edges., then turn and cook the other side for 30 seconds or until cooked through. Transfer to a serving plate and repeat until all the pancakes are made. 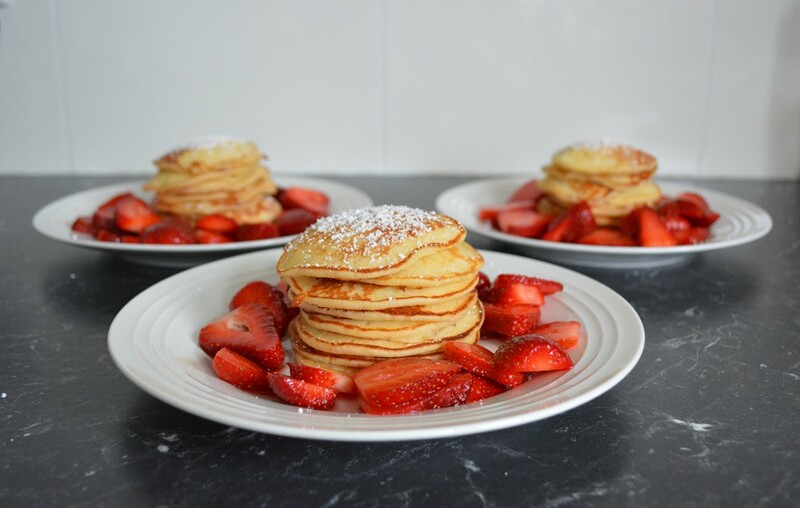 Dust lemon souffle pancakes with icing sugar, before serving them with the strawberries.